If you haven’t seen these charts and lean even slightly toward the Tea Party point of view, you ought to take a look. 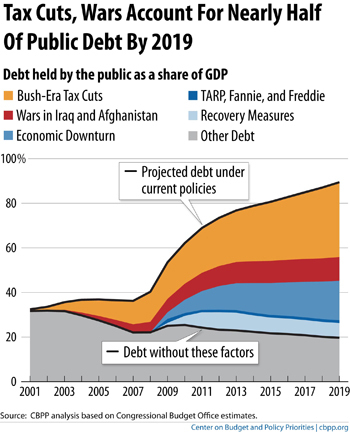 The American deficit-debt problem is largely not a result of stimulus efforts to combat a looming global financial meltdown. The problem is almost wholly composed of tax cuts for the wealthy, the economic downturn and the cost of war. Just a fact, and conveyed well by these charts, provided by The Atlantic‘s inimitable Jim Fallows.